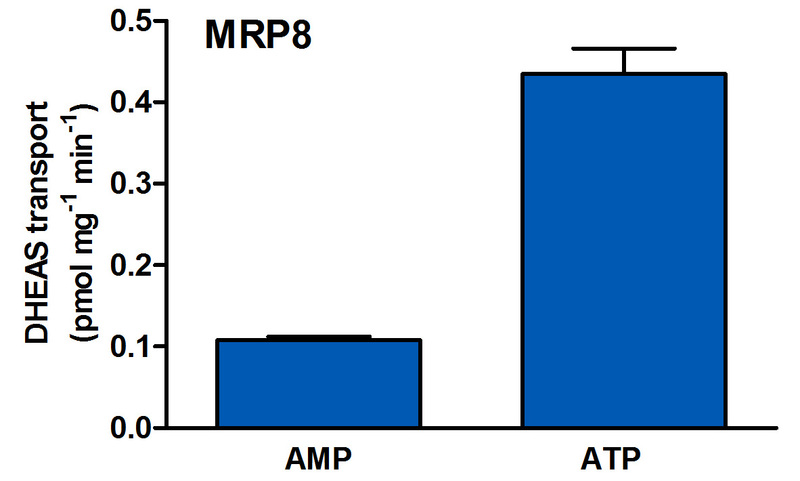 MRP8 vesicles with an ATP/AMP ratio >3 are readily available from PharmTox. Name: MRP8, ATP-binding cassette sub-family C member 11, ABCC11. MRP8 substrates: DHEAS, 5-fluoro-2'-deoxyuridine 5'-monophosphate (FdUMP), earwax, etc. MRP8 is present in: brain, breasts, lungs, liver, kidney, placenta, prostate, testes, gastrointestinal tract tissues, gastric mucosa, and apocrine glands. Available: mouse and rat MRP8.